TMSM's Adventures In Florida Living ~ Happy Halloween! Happy Halloween Everyone! Boo to You! I hope you all enjoyed your Halloween season, it’s a favorite time for us here by Walt Disney World! I’ll miss those Mickey pumpkins when they’re gone, but I’m ready for the Christmas season at Disney too! That being said, lets get caught up for the week! As most of you know, this past weekend we worked the Spooky Empire convention. We started setting up on Thursday night, and basically didn’t stop until Sunday evening. Friday we put in a 14 hour day, Saturday about ten hours, same with Sunday. The convention is one of our favorites that we’ve covered. Usually we just go there and get media badges to cover the event, but this year we had our own booth and it was FANTASTIC. We met SO many amazing people, made some new business contacts, sold a lot of clothing from our shop Lost Princess Apparel, and invited people to our TMSM Meet Up in December. I can’t say enough good things about our time working at Spooky Empire! It really did my heart good too, because people who bought clothing from us loved it so much, they put the items on and came back to show us how happy they were. This happened a lot over the weekend. How great is that? You can see what we have available at Lost Princess Apparel at www.lostprincessapparel.com! The cosplayers were out in full force as well. We saw a lot of Disney costumes in the mix of all the scary ones. Being that it’s the 25th anniversary of both Hocus Pocus and the Nightmare Before Christmas, there were plenty of costumes reflecting both movies. Speaking of Hocus Pocus….. yes, I’m sure you’ve heard the story on TMSM Weekly Live or saw my social media posts, but for those who didn’t, here you go! 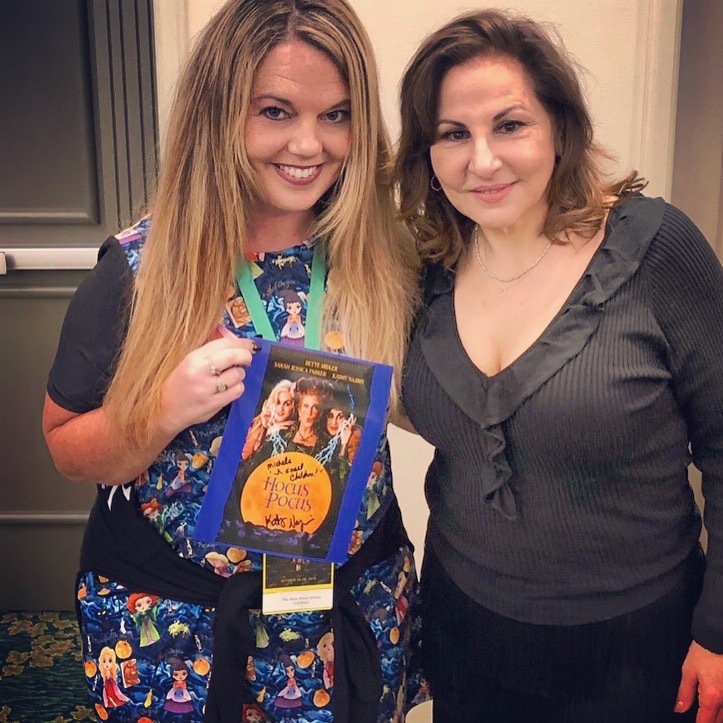 I met Kathy Najimy, aka Mary Sanderson in Hocus Pocus. Oh yes, I did! That movie is near and dear to my heart. I loved it when it hit theaters in 1993. Years later I watched it with my own kids, it’s a tradition for us. She was my ONLY must see for the weekend, so I was on a mission. When I met Kathy, she took time to talk to me, gave me an autograph, and took a few photos. She commented that she liked my Hocus Pocus dress that I was wearing, and being that it’s from our shop, I was excited. Afterwards, I went back to our booth and got her a dress just like mine and brought it to her. She gladly accepted, and my day was made. Kathy told me to come to her panel at 4:00, so I grabbed my younger kiddo and we went while Scott and my older son ran the booth. It was really interesting to listen to her stories, and cool for Aidan to see someone from one of his favorite movies. I recorded part of her talk, and I’ll post it below. We had a blast working at Spooky Empire, and can’t wait to do it again at their Spring show in March. A big THANK YOU to all of you who came out to see us! We have a giveaway this week! Details towards the end of the show! Also, we have a New travel sponsor that will be helping our members plan trips and give helpful info, MVP! You can request info from them at https://www.itams.com/TASLive/form/TMSM.